Celebrate the wonders of live music with an outdoor summer concert. Performed within the magnificent grounds of some of the country’s finest examples of British heritage, the historic architecture and beautiful grounds will act as unforgettable backdrops to the event. 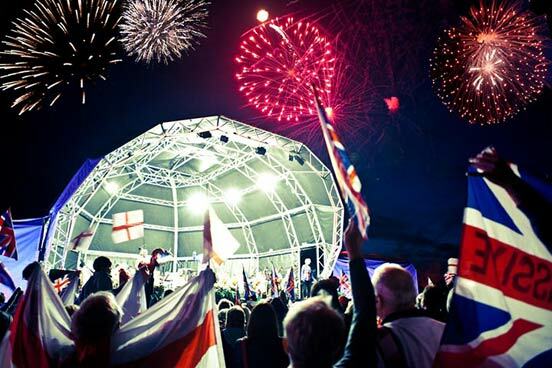 Sit back, relax and indulge in some fine British traditions as dusk settles and the sounds of the orchestra, musicians and choruses fill the open air. If you’re lucky, you might even catch the sunset. Please note, the dates for summer 2019 will be released early 2019. The experiences within the pack are subject to change. This amazing concert is a chance to see one of the most incredible sopranos in the world - Lesley Garret. With musical accompaniment provided by the London Gala Orchestra led by conductor Stephen Bell and joined by the Bedford Choral Society to provide a truly incredible sound. 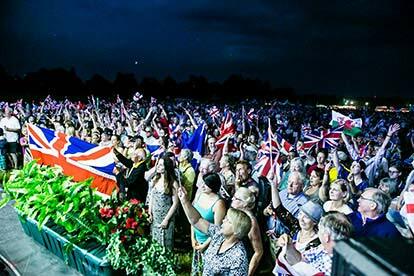 After 22 years, the Bedford Proms have earned a reputation among music fans for being an amazing night out. Not only will guests enjoy an astonishing performance from the artists on stage, but the night will be rounded off with a laser and fireworks show that complements the music perfectly. 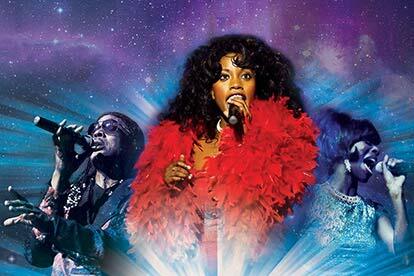 This concert takes place one date a year, usually in August, subject to availability. Folk songs have told stories of love, loss and life throughout the ages and fans will already be familiar with the beautiful harmonies and virtuoso playing associated with the genre. 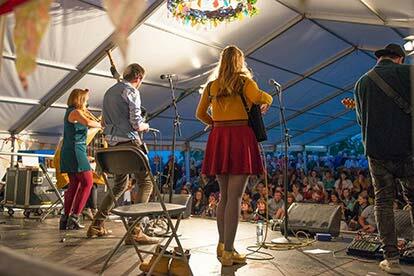 This unique festival is a chance to see some of the biggest names in folk, roots and acoustic music performing their best-known hits to crowds of music lovers in a glorious leafy, historic setting. It’s all the excitement and buzz of a 3 day festival in one sublime summer day, and as well as the top quality music acts, festival-goers are treated to a wide variety of stalls and stands, including everything from art, crafts and workshops to clothes and CDs and plenty of delicious food available too. The festival is renowned for bringing together a world class line-up of popular and established artists alongside a number of up-and-coming acts who are yet to break into the mainstream. 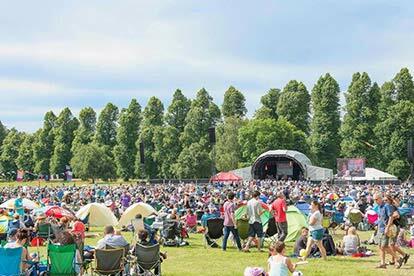 Past acts including the ever-popular Billy Bragg, barnstorming sets by the Levellers and Bellowhead and music from the country-folk singer-songwriter Mary Chapin Carpenter, as well as big names such as Kate Rusby, Richard Thompson and Beth Orton. 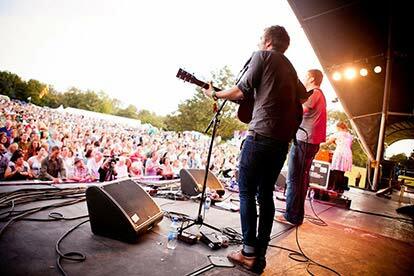 Folk by the Oak is also one of the most laid-back festivals on the scene, and guests are welcome to bring their own food and drink with them and make themselves at home in the beautiful tree-lined setting at Hatfield House. This is where Elizabeth I spent much of her childhood and it is said that under ‘the oak’ in this park is where she learned that she was to be Queen. Join in with the activities, browse the stalls, dance along or simply kick back and enjoy a whole day of exceptional live folk, roots and acoustic music! This experience is available one date of the year, usually in July, subject to availability. The festival will last all day. There is no minimum age, however under 16s must be accompanied by and adult. 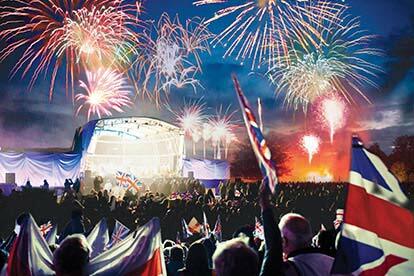 Enjoy an unforgettable evening of glorious entertainment with this Outdoor Proms Concert for two experience. 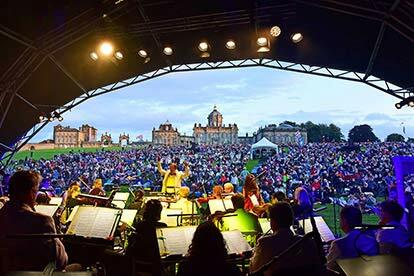 This is a thrilling open air concert, set in the grounds of some of the UK’s most celebrated stately homes. Kicking off with a cavalry display, the event begins with a thundering of hooves as the mounted cavalry demonstrate their battlefield skill-at-arms with lances, rifles and spectacular horsemanship. Then enjoy the toe-tapping warm up act and look to the sky for the breathtaking parachute display. 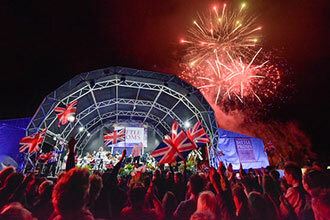 Then it’s time for the Battle Proms orchestra to take to the stage with classical hits such as the events signature piece, Beethoven's 'Battle Symphony', with a full complement of nearly 200 cannons, plus musket fire and fireworks providing a unique and breath-taking musical performance. 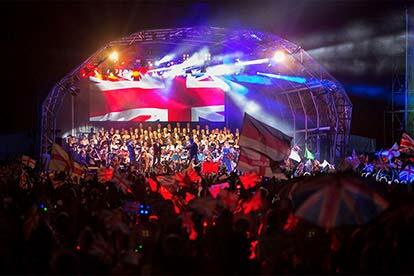 The evening will close with a traditional flag-waving sing-along, culminating in a dazzling fireworks extravaganza. Whether you’re planning a romantic evening for a loved one, or a celebration for a special couple, this could just be the unique experience you have been looking for. 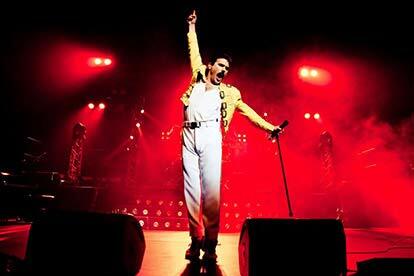 For safety reasons, please note barbecues, garden flares and pets are not permitted at the concert. The use of recording equipment is prohibited and please allow sufficient time to park your car as no vehicles are allowed on the concert area. The car park opens at 2:00pm and gates to the concert arena open at 4:00pm or 4:30pm depending on the venue. Please note, once you have booked your chosen venue tickets will be emailed to you to print at home at a least a week prior to the event. Seating is not provided so you are welcome to bring chairs/rugs as well as a picnic. Some public catering is available. In certain weather conditions, air displays will unfortunately not be possible due to safety reasons. Your experience will last for all evening, car park opens at 2pm, gates open at approximately 4pm. Music lovers will relish the chance to enjoy listening to fantastic music in glorious surroundings with this proms experience. The medieval city has plenty to offer visitors including amazing architecture, fascinating historical sights and beautiful gardens. These proms picnic concerts take place in York’s Museum Gardens which surround the medieval ruins of St Mary’s Abbey. As well as providing some insight into the city’s history, the gardens are also home to a huge botanical collection, an array of local wildlife including 40 species of bird and an incredible array of expertly-tended plants and flowers. Guests to the proms are encouraged to explore the various different gardens before settling down to listen to the proms. The musical line-up features internationally renowned soprano Rebecca Newman who has earned herself a stellar reputation as a performer who really delivers. The show will include classic favourites, show tunes, popular operatic numbers and more, all performed by a team of extremely talented orchestral musicians and internationally renowned headline acts. 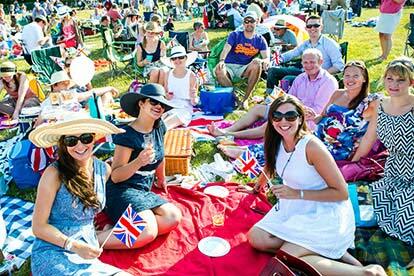 Guests will be welcomed to the Museum Gardens from 5 pm on the day of the concert. They will exchange their voucher for a wristband which will allow them access to the area in which the proms take place and they will be able to explore the gardens and find the perfect spot from which to enjoy the spectacle. Picnic blankets or chairs and hampers are positively encouraged, so it’s the perfect opportunity to push the boat out with a selection of tasty treats. The show starts between 7 and 7.30 pm, and is a real feast for the senses, climaxing with a fireworks display over the ruins that will have everyone on their feet, waving their flags and wishing the night didn’t have to end. This experience is available on one date per year, usually in June, subject to availability. This experience will last approximately 4 to 5 hours.